Dark garnet black color. 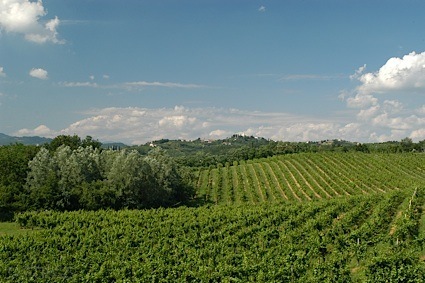 Green, fruity aromas and flavors of cassis tart a la mode, green leaves and herbs, and orange blossom beeswax with a supple, crisp, dry-yet-fruity light-to-medium body and a smooth, breezy finish with notes of craisins, pencil, and grass with dusty, woody tannins and moderate oak flavor. A savory, rustic cabernet for the table. Bottom Line: A savory, rustic cabernet for the table. 89 • Pollak Vineyards 2014 Estate, Cabernet Franc, Monticello 13.5% (USA) $26.00. 90 • Pollak Vineyards 2013 Meritage Estate, Monticello 13.5% (USA) $35.00. 91 • Pollak Vineyards 2013 Estate, Merlot, Monticello 13.5% (USA) $30.00. 90 • Pollak Vineyards 2013 Estate Reserve, Cabernet Franc, Monticello 13.7% (USA) $50.00. 81 • Pollak Vineyards 2014 Estate, Petit Verdot, Monticello 14% (USA) $30.00. 92 • Pollak Vineyards 2015 Estate, Chardonnay, Monticello 13.5% (USA) $24.00. 83 • Pollak Vineyards 2013 Estate, Petit Verdot, Monticello 14% (USA) $30.00. 84 • Pollak Vineyards 2014 Estate, Cabernet Sauvignon, Monticello 13.5% (USA) $24.00. 87 • Pollak Vineyards 2015 Estate Grown, Chardonnay, Monticello 13.5% (USA) $26.00. 91 • Pollak Vineyards 2015 Estate Grown, Petit Verdot, Monticello 13.5% (USA) $30.00. 90 • Pollak Vineyards 2015 Estate Grown, Cabernet Franc, Monticello 13.5% (USA) $28.00. 89 • Pollak Vineyards 2015 Estate Grown, Cabernet Sauvignon, Monticello 13.5% (USA) $32.00. 86 • Pollak Vineyards 2014 Reserve, Cabernet Franc, Monticello 13.7% (USA) $50.00. 85 • Pollak Vineyards 2014 Estate Grown Meritage, Monticello 14.5% (USA) $35.00. 84 • Pollak Vineyards 2017 Estate Grown, Chardonnay, Monticello 13.5% (USA) $28.00. 85 • Pollak Vineyards 2017 Estate Grown, Viognier, Monticello 14% (USA) $26.00. 80 • Pollak Vineyards 2017 Estate Grown, Rosé, Monticello 13.5% (USA) $24.00. 87 • Pollak Vineyards 2016 Reserve, Merlot, Monticello 14.5% (USA) $50.00. 92 • Pollak Vineyards 2015 Estate Grown Meritage, Monticello 13.5% (USA) $40.00. 86 • Pollak Vineyards 2015 Reserve, Cabernet Franc, Monticello 13.7% (USA) $50.00. 94 • Pollak Vineyards 2016 Estate Grown Reserve, Petit Verdot, Monticello 13.5% (USA) $35.00. 91 • Pollak Vineyards 2016 Estate Grown Meritage, Monticello 13.5% (USA) $40.00. 85 • Pollak Vineyards 2016 Mille Fleurs Dessert Wine, Monticello 16.5% (USA) $30.00. 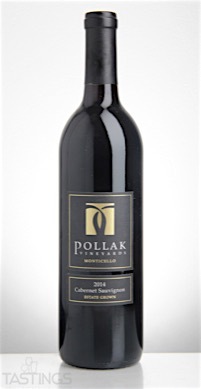 Pollak Vineyards 2014 Estate, Cabernet Sauvignon, Monticello rating was calculated by tastings.com to be 84 points out of 100 on 11/7/2016. Please note that MSRP may have changed since the date of our review.